PRO Hardware is comprised of numerous independent hardware and building supply stores around the country. With all of the resources available, you can customize programs to meet the demands of your local market with the backing of a national brand. PRO Hardware boasts $6 billion in combined buying power with a network of hardware, lawn and garden, and farm distributors. 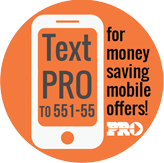 PRO Hardware has a complete advertising program to reach all of your customers. These tools will assist you in increasing your customer base by utilizing printed, fully customizable circulars, promotional signage and endcaps. Connect with a wide audience with digital resources and advertising such as social media, mobile circulars, text marketing, email specials and the PRO Hardware website. Help your customers navigate your store and find the products they need with interior and exterior signage packages. Endcaps and visual merchandising tools help you emphasize the best deals in your store, increasing sales and impacting your bottom line. Enhance the customer experience with credit card processing, PRO Rewards loyalty card, store fixtures, the Rental Stop program and other services. Join other elite PRO Hardware retailers by supporting PRO programs and your PRO Distributor by earning your way into the Achievers Club. Compete each year for the national Paul L. Cosgrave Memorial Award, recognizing the top PRO Hardware Retailer.